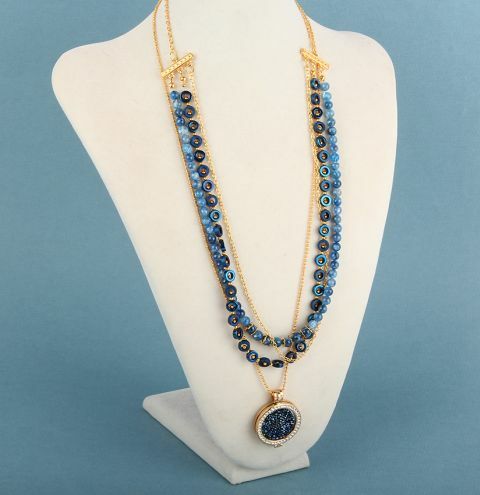 Make an interchangeable locket necklace with kyanite and hematite gemstone beads and Swarovski fine rocks! Cut 2x 4inch pieces of chain. Attach a jumpring to both ends of each piece. On one of the jumprings connect it to a lobster clasp and open the lobster and connect it to the jumpring on the other piece of chain. At each end of the chain, use the jumpring to connect to the fancy 2 hole bars. Take a new length of wire and use the same method as before to finish the end with a calotte and crimp bead. String on 7 inches of gemstone beads before adding a bead cap, bead, beadcap, followed by a gemstone bead, then bead cap, bead, bead cap until you have four capped beads in the centre of your design with 3 beads in between them. Finish the strand with 7 more inches of strung beads, complete the end and connect it to the bar with a jumpring. Open the locket and fit the Swarovski fine rocks disk inside. Open the ball chain and string on your locket.